Plant tissue culture is a practice used to propagate plants from cells or tissues under sterile conditions to produce clones of a plant. When disease-free material is used as the source of explants or the explants are heat-treated to eliminate the diseases, the resultant micro propagated plants are disease-free and healthy. Sugarcane, a versatile crop cultivated by the farmers in Tamil Nadu and being a rich source of sugar, ethanol, biogas, manure, production of electricity, paper etc. During the cultivation, sugarcane leaves were used as a cow feed which require less amount of water compared with other crops and will take at least 10 months to mature. Realizing the advantages of sugarcane, people often preferred it for planting, even though the plantation period is more. In the cultivation period, lot of seedlings was unable to grow into a plantlet and hence, many researchers focused to produce a healthy, disease free plant by biotechnological approaches like micropropagation. 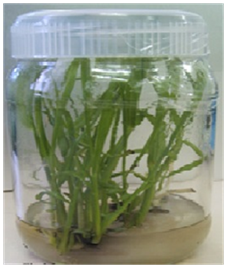 Numerous reports revealed that micropropagation techniques were suitable for commercial seed production in sugarcane. To obtain sugarcane mosaic virus free plants, more emphasis was focused on apical meristem an explant.1,2 With the help of in vitro techniques, lot of interest has been generated in the recent year for rapid multiplication of virus free materials through apical meristem culture3 and callus culture.4 From the published data available, it is evident that every part of the sugarcane plant is capable of inducing callus; however, only immature leaves5 and the inflorescence are capable of producing morphogenic callus to an appreciable level. In sugarcane variety, Co-91017 is an important crop in Tamil Nadu which was cultivated by maximum number of farmers. During the process of plantation, most of the plants will not grow into plantlets and hence the present study was delineated to evaluate the optimum concentration of growth hormones required by the plantlets micro propagated under in vitro conditions, which will further be supplied to farmer for plantations. Media often need to be varied for different plant genera and species according to the kind of culture to be undertaken. MS media as reported by Murashige et al.,6 or modified MS media as supplemented with various plant growth regulators have proved to be suitable for callus growth, direct and indirect morphogenesis and shoot culture of sugarcane as reported by several authors. The medium was prepared by adding required amounts of stock solutions and final volume was made up with deionized water. The pH of the medium was adjusted to 5.8 by using 1N KOH or 1N HCl and were autoclaved at 121°C for 15minutes. The sterilized medium was then transferred to media storage room under aseptic conditions. 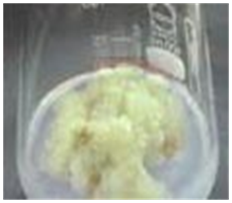 MS medium supplemented with the different range of concentration of auxins were tried individually for callus induction such as 2,4-D (0.5, 1.0, 2.0, 2.5 and 3.0mg/L) and NAA (0.5, 1.0, 2.0, 2.5 and 3.0mg/L) with liquid MS basal medium. MS medium supplemented with the different concentrations and combinations of Kinetin, BAP (0.5-3.0mg/l) and IBA (0.5 & 1.0mg/l) for multiple shoot regeneration. It was sub-cultured every 7days of incubation. 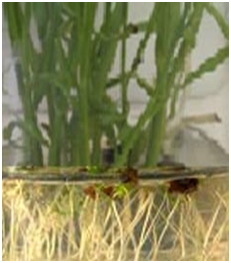 Micro shoots were measuring about 5-6cm in length and transferred to half-strength MS medium supplemented with different concentrations of IBA and NAA (0.5-3.0mg/l) either individually or in combinations. The kind of the culture to be initiated. Shoot tip explants can be obtained from three sources: actively growing canes, elongating axillary shoots and dormant axillary buds. In our experiment, shoot tip is an explants collected from actively growing sugarcane tops. The leaf sheaths of sugarcane were carefully removed one by one until the inner white sheaths were exposed. The explants were sized to 10cm length by cutting off two ends, locating the growing point in the middle of the top. Actively growing points of sugarcane top, taken as explants from 8-12months old sugarcane cultivar. The outer mature leaves were removed till a spindle of about 1cm was obtained. The spindle (3.0-4.0cm) was excised and thoroughly washed 30minutes under tap water. The explants were washed thoroughly for 20-30minutes under running tap water, 0.1% mercuric chloride for 10minutes. Finally, the young shoot tip was washed thoroughly with sterile distilled water for 3 to 5times. The explants were picked up carefully with sterilized forceps and kept in a sterile Petri dish. Using a fine scalpel and forceps, which are heated and cooled every time before and after use, the leaf sheaths were removed one by one till the suitable size were obtain (2 to 2.5cm). Initially, 3 to 4 longitudinal slits was given superficially through the scalpel. By charitable superficial transverse cuts on the base, the leaf whorl was removed carefully without exert pressure on the internal tissues. The repeated process is done until the apical dome with 2 to 3 leaf primodia was exposed. This process should be done very carefully without damaging the apical dome. The young shoot tip explants was sterilized and inoculated on sterilized MS medium6 supplemented by various concentration and combination of plant hormones. In medium the pH was adjusted in the direction of 5.8 and autoclave for 15minutes at 121 ̊C. The cultures were incubated with 16hour of light and 8 hour of dark (fluorescent tubes are used as a light source), with artificial illumination of 2000-3000 lux by placing the cultures at 25-30cm below the fluorescent light and maintain the temperature at 25±2 ̊C. 10 replicates/ treatment. Means are calculated by Duncan’s multiple range test at the significance level of 5%. Sterilized explants of Co 740 showed significant callus induction on MS medium containing 100 mg of myo-inositol and 3 mg/l of 2,4-D and 10% v/v coconut milk, and callus induce from leaf explant supplemented with 2,4-D at the concentration of 5.0 mg/l showed.16 The concentrations of NAA (2.0 and 3.0 mg/l) induced calli (20 to 30%) which was globular, grayish and hardy in nature. All these study resembles that sugarcane plant requires higher concentration of 2,4-D for callus induction (Table 1). Table 3 Effect of different concentration of IBA and NAA on root induction on shoot tip of sugarcane variety Co-91017. In the present study, protocol was developed for in-vitro propagation of sugarcane and was optimized by manipulating different concentration of growth regulators for rapid and efficient callus induction, shoot and root regeneration. Percentage of callus (90%) induction was found to be better in MS liquid medium amended with 2,4-D at a concentration of 2.5mg/l and 3mg/L. Cytokinin were found to play an important role in shoot initiation and was observed that half-strength liquid MS media at the combination of 2.0mg/L of BAP and 0.5mg/L IBA showed better result of bud break in Co-91017. NAA at the concentration of 2.5mg/l showed better response for rooting then IBA. Finally, the in-vitro propagated plants were then transferred into field and the survival rate was found to be 85%. Coleman RE. New plants produced from callus tissue culture. Sugarcane Research Report. Pl Sci Res Div, USA: Dept Agric Res Serv; 1970. 38 p.
Hendre RR, Mascarenhas AF, Nadgir AL, et al. Growth of mosaic virus–free sugarcane plants from apical meristems. Indian Phytopathology. 1975;28:175–178. Hendre RR, Fyer RS, Kotwal M, et al. Rapid multiplication of sugarcane. Sugarcane. 1983;1:5–8. Ali A, Shagufta N, Iqbal J. Effect of different explants and media composition for efficient somatic embryogenesis in sugarcane (Sacchraum officinarum L.). Pak J Bot. 2007;39(6):1961–1971. Naz S, Ali A, Siddique A. Somatic embryogenesis and plantlet formation in different varieties of sugarcane (Sacchraum officinarumL.) HSF–243 and HSF–245. Sarhad journal of agriculture. 2008;24(4):593–598. Ali A, Shagufta N, Siddiqui AF, et al. Rapid clonal multiplication of sugarcane (Sacchraum officinarum L.) through callogenesis and organogenesis. Pak J Bot. 2008;40(1):123–138. Irvine JE, Benda GTA. Transmission of sugarcane diseases in plants derived by rapid regeneration from diseased leaf tissue. Sugarcane. 1987;6:14–16. Murashige T, Skoog F. A revised medium for rapid growth and bioassays with tobacco cultures. Physiology Plantarum. 1962;15:473–497. Gomez KA, Gomez AA. Statistical procedures for agricultural research with emphasis on rice. Los Banos, Phillipines, Asia: International Rice Research Institute; 1976. 294 p.
Khan IA, Khatri A, Ahmed M, et al. In vitro mutagenesis in sugarcane. Pak J Bot. 1998;30:253–261. Khatri A, Khan IA, Javed MA, et al. Studies on callusing and regeneration potential of indigenous and exotic sugarcane clones. Asian Journal of Plant Sciences. 2002;1(1):41–43. Begum S, Hakim L, Azam MA. Efficient regeneration of plants from leaf base callus in sugarcane. Plant Tissue Culture. 1995;5:1–5. Barba RC, Zomora AB, Mallion AK, et al. Sugarcane tissue culture research proc. ISST. 1978;16:1843–1864. Cheema AS, Singh H, Gosal SS. Response of different genotypes to callus induction and plant regeneration in sugarcane. Crop Improvement. 1992;19(1):6–13. Mohatkar LC, Chaudhuri AN, Deokar AB, et al. Organogenesis in Saccharfum officinarum L. variety Co 740. Current Science. 1993;64(8):604–605. Islam AS, Begum HA, Haque MM. Regeneration of Saccharum officinarum for disease resistant Varieties. Proc Int Cong Plant Tissue and Cell Culture. 1982;5:709–710. Davey MR, Chen WH, Gartland MA, et al. Transformation of sugarcane protoplasts by direct uptake of a selectable chimeric gene. Plant Cell Reports. 1987;6(4):297–301. Dhumale DB, Ingole GL, Durge DV. In vitro regeneration of sugarcane by tissue culture. Annals of Plant Physiology. 1994;8(2):192–194. Patel AA, Patel SR, Patel CL, et al. Effect of media composition on in vitro multiplication of sugarcane varieties. Ind J Gen Pl Breed. 2001;61(1):82–83. Maretzki A, Nickell LG. Formation of protoplasts from sugarcane cell suspensions and the regeneration of cell cultures from protoplasts. In: Protoplasteset Fusion de Cellules Somatiques Vegetables. Colloq Int C N R S. 1973;212:51–63. Maretzki A. Tissue culture:Its prospects and problems In: Heinz DJ editor. Sugarcane Improvement through breeding. BV, Netherlands: Elsevier Science Publications; 1987. p. 343–384. Lal N, Singh HN. Rapid clonal multiplication of sugarcane through tissue culture. Plant Tissue Culture. 1994;4:1–7. Baksha R, Alam R, Karim MZ, et al. Effect of Auxin, Sucrose and pH Level on in vitro rooting of callus induced micro shoots of sugarcane (Saccharum officinarum L.). Journal of Biological Sciences. 2003;3(10):915–920. Sabaz Ali Khan, Hamid Rashid, Fayyaz Chaudhary M, et al. Rapid micropropagation of three elite Sugarcane (Saccharum officinarum L.) varieties by shoot tip culture. African Journal of Biotechnology. 2008;7(13):2174–2180. Gosal SS, Thind KL, Dhaliwal HS. 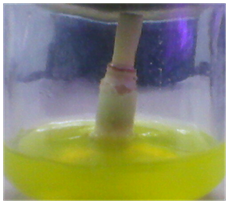 Micropropagation of sugarcane. An efficient protocol for commercial plant production. Crop Improv. 1998;2:167–171. Ali FA, Afghan S. Rapid multiplication of sugarcane through micropropagation technique. Pak Sugar J. 2001;16(6):11–14. Nadar HM, Heniz DJ. Root and shoot development from sugarcane callus tissue. Crop Sci. 1977;17:814–816. Alam R, Mannan SA, Karim Z, et al. Regeneration of sugarcane (Saccharum officinarum L.) plantlet from callus. Pak Sugar J. 2003;18:15–19. Mamun MA, Sikdar MBH, Paul, et al. In vitro micropropagation of some important sugarcane varieties of Bangladesh. Asian Journal of Plant Sciences. 2004;3(6):666–669. Pawar SV, Patil SC, Jambhale VM, et al. Rapid multiplication of commercial sugarcane varieties through tissue culture. Indian Sugar. 2002;52(3):183–186. Cheema, Ravinder Kaur, Gupta JN. Plants regenerated from protoplasts of sugarcane (Saccharum officinarum L). Current Science. 1995;68(6):650–653. ©2015 Dinesh et al. This is an open access article distributed under the terms of the Creative Commons Attribution License , which permits unrestricted use, distribution, and build upon your work non-commercially.